It is evident that an old dog can learn a new trick by virtue of the fact that I learned a new trick the other day. Just as the revelation that you don’t have to boil a vat of water to cook pasta, this involves the simple fact that if you put cut up potatoes in water in a plastic container and microwave them for 4 to 5 minutes you will have perfectly cooked potatoes. I learned this revolutionary, at least to me, technique at the Publix. I am sure you already know that if you visit the Publix at just the right time of day you can literally eat your way through the store for free. There are samples of meat and cheese at the deli, perhaps some hummus and crackers near the checkout lines, grilled steak in the meat department and the ever-present Publix lady at her cooking station just before the produce department. The other day the Publix lady was making pork tenderloin and butter roasted potatoes. They were utterly delicious and I inquired as to how she had prepared the potatoes. She informed me that she had first cooked them in the microwave. Really? Instead of waiting 10 to 15 minutes for water to boil and then another 10 to 15 minutes for the potatoes to cook you just throw them in the microwave covered in water for 5 minutes? It works like a charm every time. Just cut them in chunks, cover them in tap water and let ‘er rip. To gild the lily, you can then roast them in butter. Just melt a proper amount of butter in a coffee cup in the microwave (I figured out that time- and pot-saving tip on my own), coat the potatoes with the butter. Apply a sprinkling of salt and pepper, and roast them at 400 degrees until they take on that lovely browned hue of a good roasted potato, about 15 minutes. As you can see here, I am very partial to those cute bags of a variety of potatoes including red, Yukon and blue variations. I would stick with a waxy potato for this preparation. And if you wipe the potatoes through the excess butter that collects in the baking sheet, I will not tell a soul. I will try this potato shortcut right away. 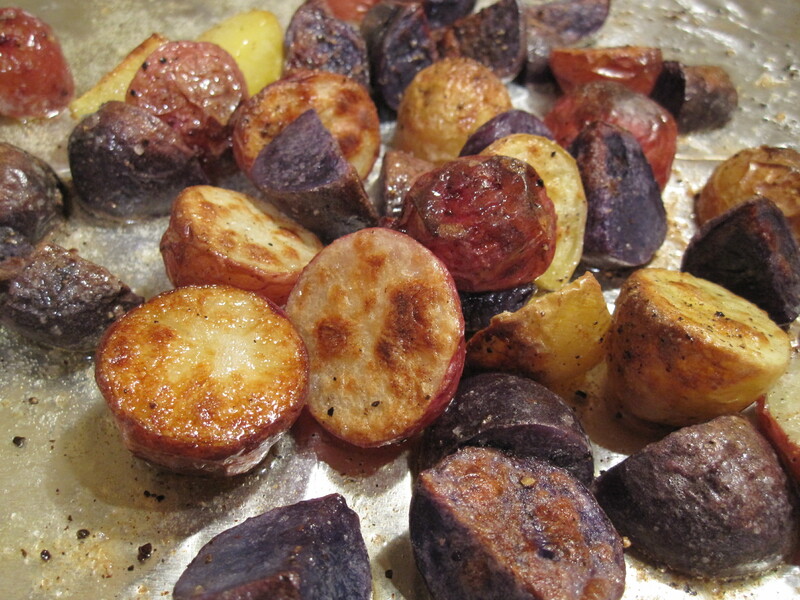 Great way to make roasted taters! Of course, now I want to know what the unfortunate incident was!